First, a grim reminder: today is the last day to turn in your badge for a refund. Hopefully this doesn't apply to any of you. Now onto something more fun: a "Roughed-Up" Penguin from Diamond's Gothic line. That is his official name as the action figure captures Oswald in the bloody, disheveled yet defiant look we know so well. He's cheap at $20 - but there's only 150 of him. Nothing highlights the absurdity of the term "exclusive" as seeing Amazon offering this Ant-Man Minimates Box Set. We got some information on the Supernatural panel: the first footage of the Winchester boys "battling Darkness" might be shown - and they will reportedly give a video presentation on series highlights, then showcase some special DVD features. In other words, this panel just became even more un-missable for Supernatural fans. 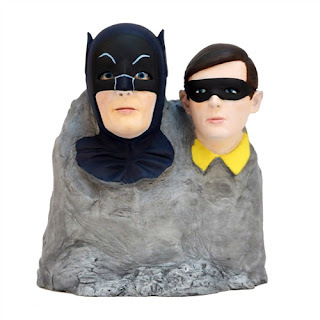 Much as I love both Factory Entertainment and the 1966 Batman show, I would not even sleep in the same room as this creepy staring Batman and Robin monolith that looks like an effigy made by a serial killer in Arkham Asylum. Your mileage may vary. On the business-y side of things, the New York Times is interested in how big studios "find commerce in the chaos" at SDCC. (They also referred to us as "sweaty.") Specifically they focused on a small business started by 2 superfans who are figuring out how to take that audience excitement in Hall H and turn it into momentum in what can be a long stretch between SDCC and an actual movie release date. Strategies including offering tickets months before an opening, bundled with other content and merchandise, and of course collecting fan data. What does that mean practically? It means that studios that might normally see SDCC as too early to effectively market their movie/show may shift into viewing SDCC - or any Con - as just a powerful launch pad that's only step 1 in a sustained campaign for attendee interest. I have a feeling that this week will bring more of the same type of announcements we've been getting, and then the following week will start shaking the ground under our feet. Stay tuned.